An intraoral camera is a dental device designed for examination and diagnostic purposes. They come in many varieties, but they all essentially accomplish the same tasks. While they are a relatively new technology that started seeing use as early as the 1990s, it’s become largely ubiquitous in dental offices around the country. It resembles an oversized pen and has an attached camera on the end of it. The most notable benefit of having an intraoral camera is its diagnostic capability. 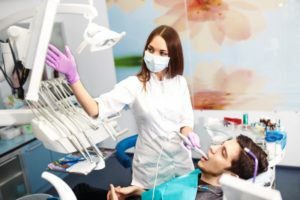 Locating and visualizing tooth decay, gum disease and signs of underlying conditions as high quality images, gives the dentist a different perspective and improves the overall quality of care. Of course, benefits are not exclusive to the dentist. One of the biggest reasons why intraoral cameras are so popular is because of the insight they provide patients. It’s understandable if you’ve been skeptical of a dental diagnosis with previous dentists, but now you can confirm exactly what the dentist is seeing instead of solely relying on them to explain their findings. If you don’t have any pain or noticeable issues, it can be difficult to understand why you should get treatment in the first place. For example, if you were told that you needed a dental restoration, but were hesitant to believe you needed one, an intraoral camera can provide the additional verification you were looking for. Highly-detailed images can show where decay or a crack is located and why a dental filling or crown may be the next best course of action. Before being used, the intraoral camera itself has been disinfected. During your exam, the dentist places a clear film around the head of the intraoral camera, which makes sure that every time the dentist uses it, they aren’t transferring bacteria from a previous patient. During the exam, the dentist will take photos using a button on the wand itself, which then sends these pictures to a monitor on a nearby display. Having the most information available about a given condition leads to a more accurate diagnosis, better understanding by the patient and a more predictable treatment outcome. For example, Intraoral images can sometimes show characteristics of a tooth that are not visible in X-rays such as cracks & shades of teeth. However, without X-rays it would be difficult to see other characteristics like decay between teeth and the bone level around them. Therefore, dentists are able to combine the information from X-rays with current high-tech intraoral images resulting in a better overall understanding of what’s happening inside your mouth. Ready to experience the intraoral camera during your next exam? Schedule an appointment to protect your oral health with the best technology out there! Cochell Family Dentistry uses Dexis Intraoral and Nikon Extraoral cameras to help you understand your mouth’s current condition and present the best treatments you should consider. In dentistry, peace of mind matters, and advanced dental technologies like these make that possible. To learn more, you can contact Drs. Christel and Travis Cochell through their website.